Courtney Stadd, former NASA chief of staff. WASHINGTON — Former NASA chief of staff Courtney Stadd was due to report Feb. 4 to a federal correctional institute in Morgantown, W.Va., to begin serving a 41-month sentence for a conspiracy conviction. Stadd, 55, of Bethesda, Md., was convicted in federal court last August and sentenced in November for conspiring with Liam Sarsfield, then NASA’s deputy engineer of programs, to steer money to Stadd's consulting firm and submitting false invoices. Sarsfield was separately convicted on a conflict of interest charge and sentenced last September to three years probation. Stadd, in a Feb. 1 e-mail to family, friends and colleagues, wrote that he was due to "self-report" to a minimum security prison in Morgantown where he expects to spend "the next couple years." Stadd, NASA’s chief of staff from 2001 to 2003, was convicted and sentenced in 2009 to six months of house arrest for breaking government ethics laws in directing $10 million in NASA funds to Mississippi State University. 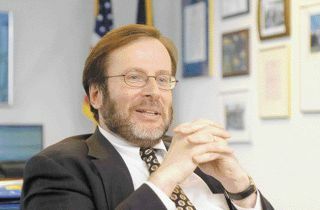 The school was one of Stadd’s consulting clients between his stints at NASA; he briefly returned to the agency in mid-2005 to help with a reorganization under then-NASA Administrator Mike Griffin. Following his 2009 conviction, Stadd was indicted for conspiring with Sarsfield to steer a $600,000 NASA remote sensing study contract to Mississippi State, which subcontracted $450,000 of the funds to Stadd and Sarsfield. Stadd on Aug. 18 pleaded guilty in Gulfport, Miss., before U.S. District Court Judge Sul Ozerden and admitted to submitting falsified invoices to Mississippi State and meeting with senior government officials to try to stop a NASA inspector general investigation of his activities. In his Feb. 1 e-mail, a copy of which was obtained by Space News, Stadd said he was driven by "financial devastation and emotional turmoil" to "very reluctantly plead guilty." Stadd also said he had expected to receive a lighter sentence than the 41 months he has been ordered to serve. "As part of their original plea bargain terms, the prosecution had agreed to the lower end of the sentencing guidelines — 24 months," Stadd wrote. "But when it came time for the Judge to issue his sentence, true to form, they remained completely silent and poker-faced regarding their agreement to a lesser punishment and tacitly acquiesced to the harsh sentence terms: 41 months and restitution and fines of well over a quarter of a million dollars."